What I hid in my sock was beautiful. It was made with two bands totaling 13 stones. They sparkled under any light. What Julieta thought I drove her 1500 miles across the United States for wasn’t the real reason. She hadn’t seen her family for some time and we believed it would be a worthwhile experience in developing our relationship. I had never been so far from my family; I had never driven so far either. Our destination was Chicago, Illinois. We were going to travel across five states in two days. 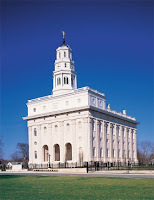 The prevailing thought on my mind was what would take place in the city of Nauvoo on the return home. My wife and I enjoyed this movie tonight. It was funny and had a great lesson about what's important in life. Go see it before it leaves the theatres!